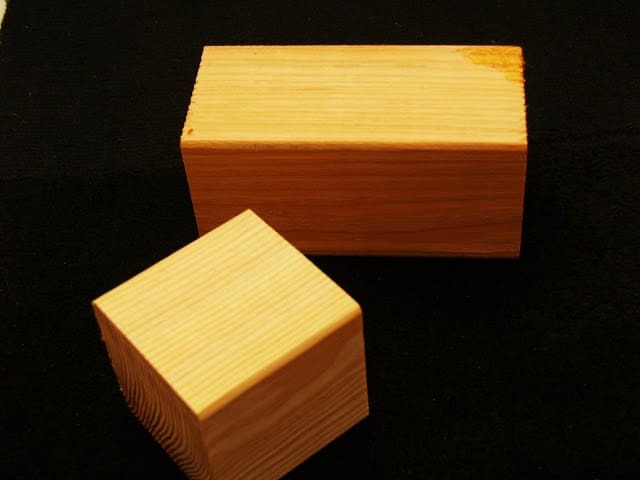 First sand and paint your blocks. 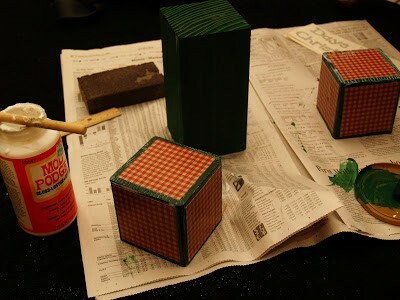 I knew that I wanted to use red scrapbook paper on my blocks, so I painted them green to start. Then cut your scrapbook paper to be slightly smaller than the block I cut my paper to be 3×3 for my 3.5 inch blocks. When the paint it dry, Mod Podge all 12 sides of your smaller blocks with your paper. You can use all different papers, or the same one. Then on one long side of the big block Mod Podge a piece of scrapbook paper, the size of my paper was 6.75×3. 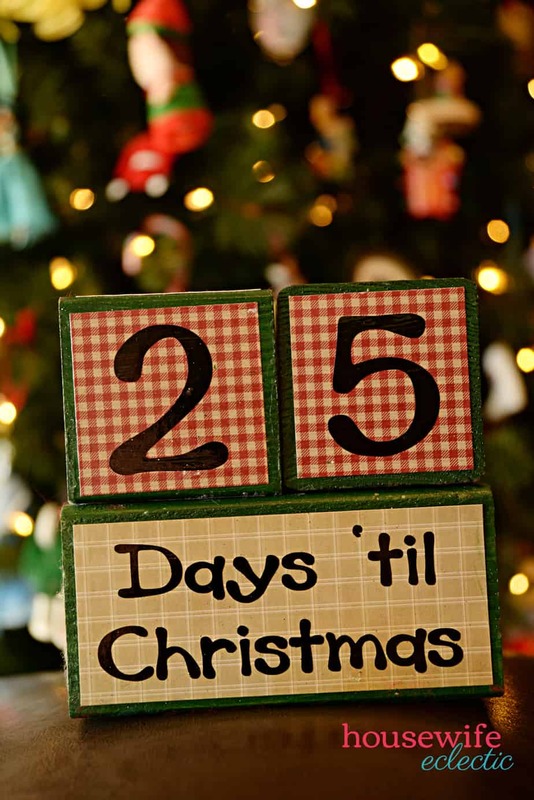 Then you adhere the vinyl with the words “Days ’till Christmas” on the big block and the numbers on the other. The numbers 0,1,2,7,8,9 need to go on one block. Use a 9 that can be doubled as a six. 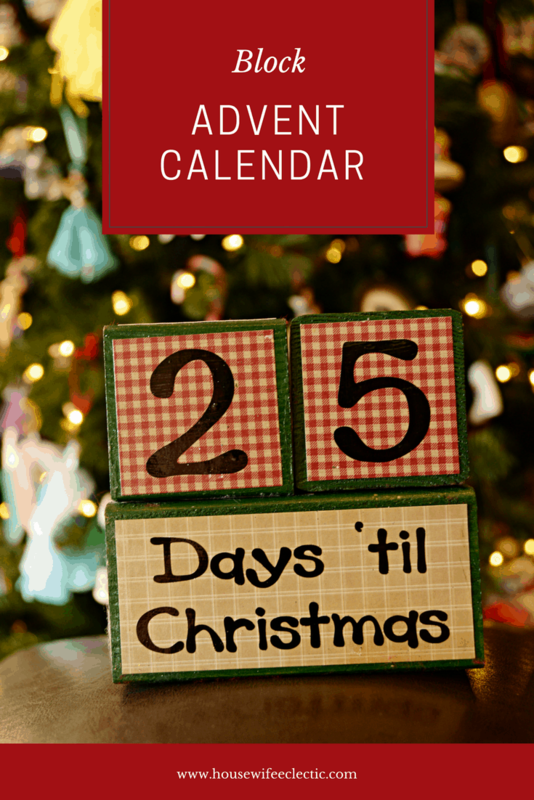 The numbers 0, 1, 2, 3, 4, 5 need to go on the other block and you will be able to do all of the days left until Christmas starting on the first day of December (and some days before.) I used numbers that were about 2 inches high and letters that were about 1 inch high at the tallest point of the capital D.
There you have it, a cute, simple advent calendar to count down the days until Christmas with. Very cute idea! Now just so the kids don't keep changing the numbers. 🙂 I mean, I used to have nice block letters that spelled NOEL. My kids always switched them to read LEON or ONLE. Sigh. I like the colors you chose too. Cute countdown idea. Love, love, love this! I'll have to shop in January for supplies for this so we can do it next year. This is such a fantastic project. I would love it if you linked to our party! I really love these. I keep thinking I'm going to make some but never get around too it. These are so cute though. It may just be the inspiration I need. Thanks for sharing. Turned out so cute! I love this idea.